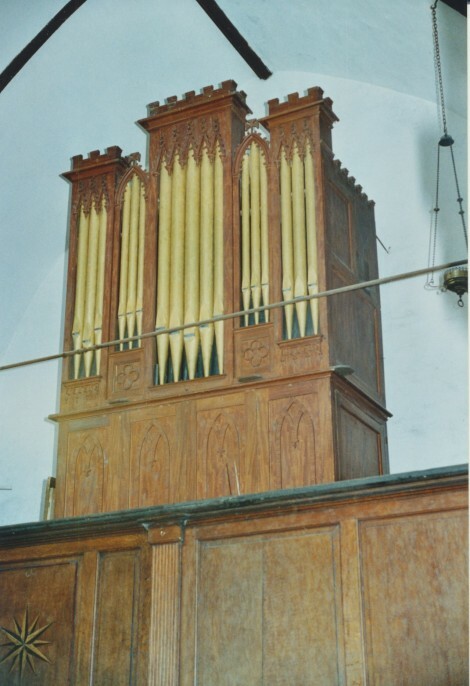 The local squire, John Fuller, gave the organ in about 1820. He had already encouraged the psalmody in Brightling church by providing nine bassoons to accompany the singing. The pitch is 434.17Hz at 20ºC. The tuning is 1/4 comma meantone. The wind pressure is 43mm. The bellows is blown by foot pedal, independently of the barrel mechanism, which means that the ‘player’ can dwell on a note (e.g. the initial reciting note), without worrying about loss of wind. The last ones (12) on each barrel are not available, and have been replaced with the transposed tunes at the opposite end of the barrel, which sound ghastly in meantone of course, which may be why there are no notes played in the bottom octave.